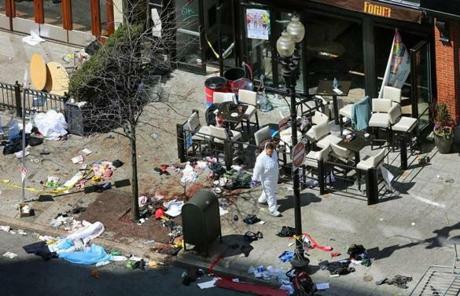 Two bombs tore through the crowd around 2:50 p.m. on Boylston Street. 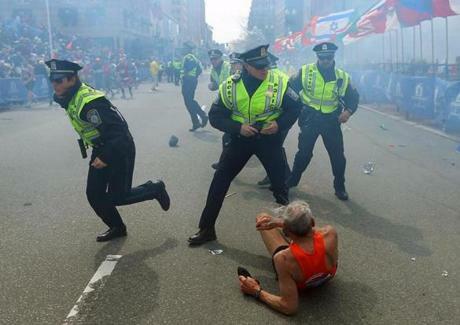 Police officers with their guns drawn heard the second explosion down the street. 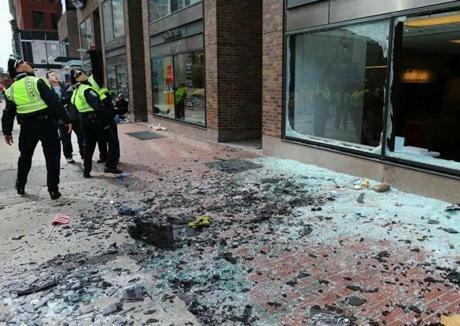 Police looked at blown out windows at the scene of the first explosion. 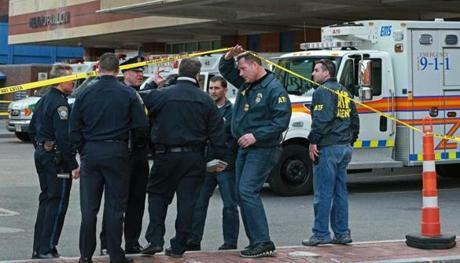 Federal agents joined Boston police at the scene outside the emergency room of the Boston Medical Center. 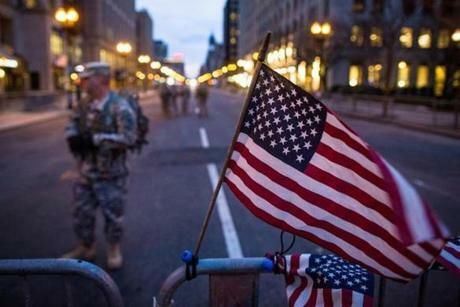 By early Tuesday, a memorial for the victims of the attacks began to form at Boylston and Berkeley streets. 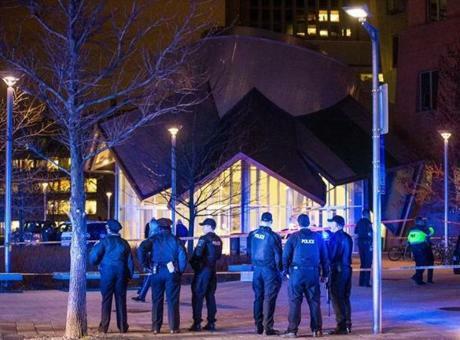 Investigators worked at the site of the second bomb explosion. 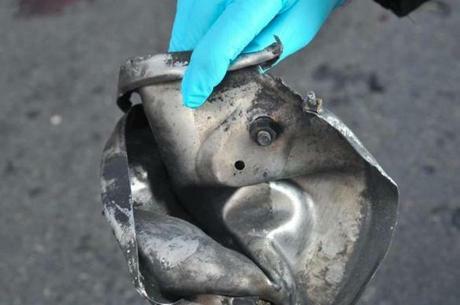 Marathon bomb scene pictures taken by investigators showed the remains of an explosive device. 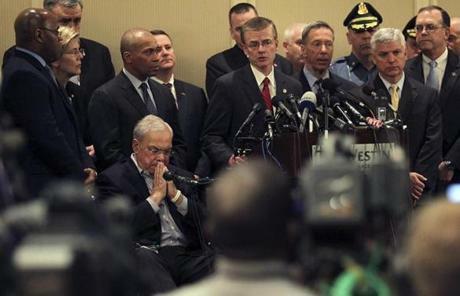 Officials spoke to the media Tuesday at their command post, the Westin Copley Place hotel. Ultimately, 1,000 investigators would be based there. 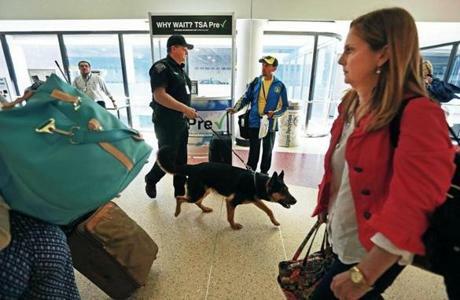 State Trooper Mike Currier and his dog "Chico" patrolled Terminal B at Logan Airport. 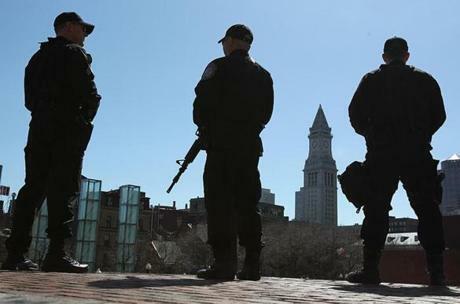 Armed members of the Regional Response Team took up position at City Hall. 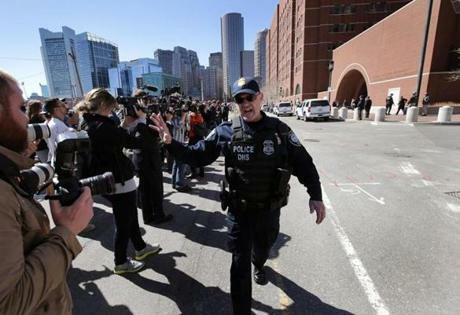 A bomb threat on Wednesday caused the evacuation of the Moakley federal courthouse. On Thursday, FBI agents released images of the suspects. 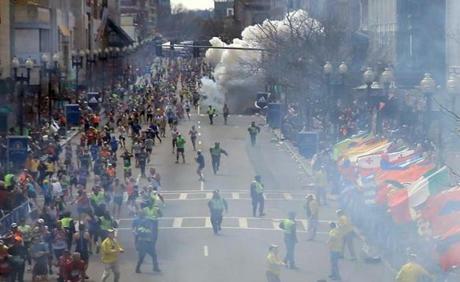 They were later identified as Tamerlan and Dzhokhar Tsarnaev, brothers who emigrated with their family from Russia in 2002. 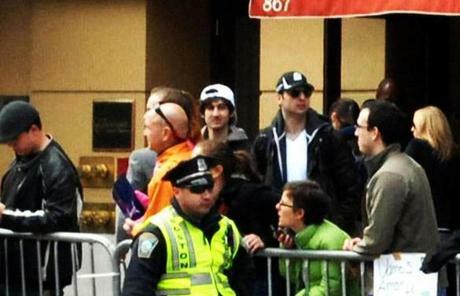 The bombing suspects together on the street, the day of the Boston Marathon attack. 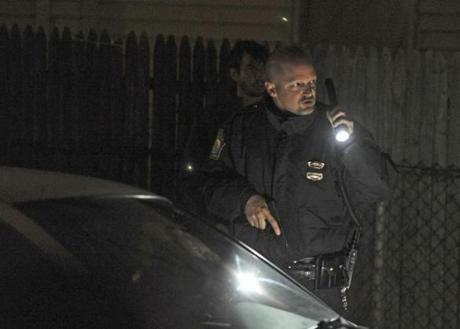 MIT Police Officer Sean Collier was shot to death late Thursday near the university in Cambridge. The alleged bombers were suspected. 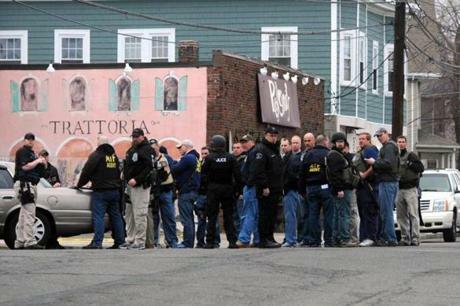 Law enforcement agencies congregated in Watertown following a police chase. Friday began with one suspect dead, a region locked down, and a massive manhunt underway. 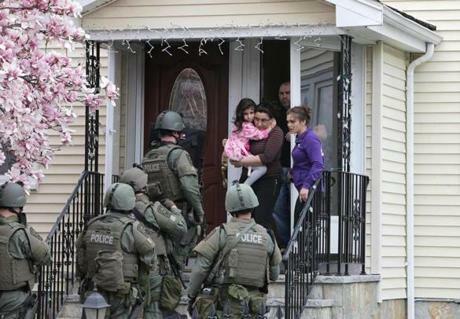 SWAT teams conducted a house-to-house search in Watertown. 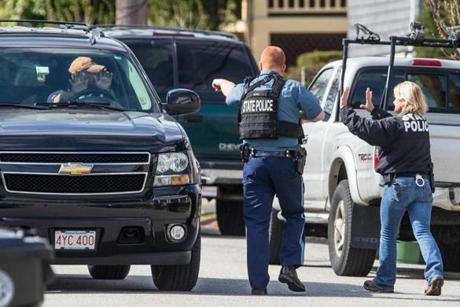 State Police stopped a car at the intersection of Carver Road and Belmont Street in Watertown. 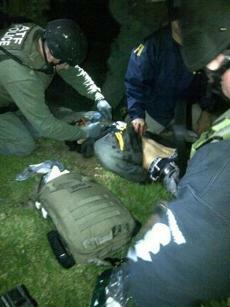 A wounded Dzhokhar Tsarnaev was handcuffed, bringing the nightmare of a daylong manhunt to a dramatic end. 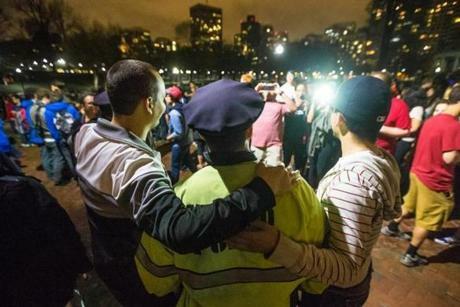 After the arrest, police officers were cheered as heroes. One of them posed with admirers on Boston Common.